2. Lr.R.C.NO 1/246/TE/SCERT/2017, Dt.21-08-2017. SCERT, AP. Education Officers and Secondary School Headmasters in the State arc informed that vide reference is cited above,as per the direction of Hon'ble Chief Minister to Department of School Education, it was decided to institute 'అభినందన', a Schools Recognition Program to recognize and appreciate best performing schools. 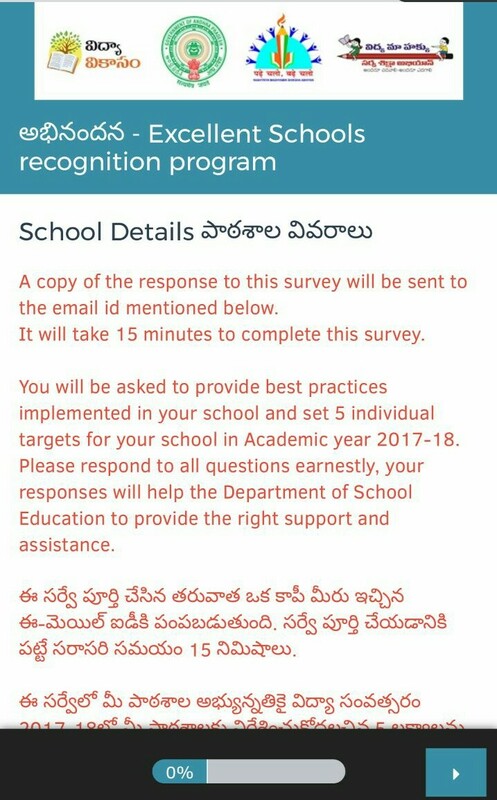 'అభినందన' is an initiative to disseminate recognition/concern letters to all secondary schools in the state and appreciate teachers on their contribution to students' performance. based on the SSC examination results. parameters for every subject, viz. A composite school level rank (on a scale అఫ్ ౦ -24), based on the cumulative subject performance stated above is awarded to each school containing four possible rankings. viz. 1) Excellent, 2) Very Good, 3) Good, 4) Needs Improvement. overall performance rank achieved by the school. encouraged to set targets for this academic year and provide feedback and seek help from the Department of School Education. It is mandatory for all Headmaster to honestly Complete this survey using the link provided. DEOs and Dy.EOs are requested to widely disseminate the proceedings to all Secondary schools in the state and closely monitor the Collection of the survey.